Cultivating young leaders is a core aspect of our mission. Roseline Sonday was promoted from teacher’s aide to the instructor of the cosmetology department in July. She is an experienced hairstylist and used her time as a teacher’s aide to learn how to apply facials and provide manicures and pedicures. Her journey started with Uniting Distant Stars in 2014. 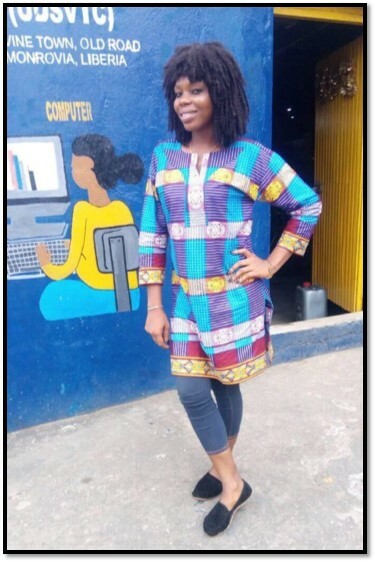 She was one of four youth who piloted our backpack project from September to December 2014. In the program, students learned how to make backpacks from recycled drinking water sachets. She joined the training team of the 2015 Backpacks for Peace Service Learning Project that trained 20 youth to make the same backpacks. Later that same year, these backpacks were donated and filled with school supplies to give to young school children. When we secured our training center in 2016, she helped with painting the exterior of the building and refurbishing the facility. She was also part of the recruitment team that same year and helped with finding youth to enroll for the first term starting February 2017. She became the student coordinator and cosmetology teacher’s aide for the 2017/2018 term. She continued both roles this term and recruited the instructor, Felton Waydiyee Fouah. Earlier in July, Felton moved to a different location, and the distance to travel made it impossible for him to continue his work UDS. Felton told Kelvin Fomba, UDS Co-Founder & Director, that Roseline was ready to be an instructor. 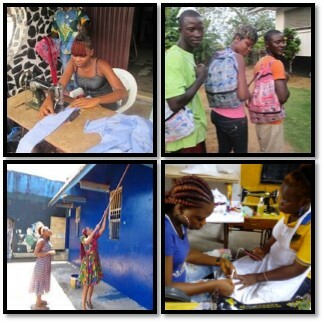 From left to right, top to bottom: Roseline sewing backs in 2014. She is modeling the backpack to promote 2015 Backpacks for Peace Project. She is painting the exterior wall in 2016. She is giving a manicure in 2017. Roseline is one of our shining stars in Liberia! She is grateful for the opportunities she had with UDS, and her next goal is to attend college. She is now waiting for the results of her entrance exam to the Univerity of Liberia. Her dream is to get her college degree because she would be the first in her family. Roseline is the fifth born out of eight children, and sadly, she had one brother die this year. She is steadfast in accomplishing her goals, and we support her every step of the way. Congratulations to Roseline Sonday for all your great service and work for the youth of Liberia! This entry was posted in Africa, Cosmetology Instructor, education, Liberia, Promotion, Roseline Sonday, Thank You, Uniting Distant Stars, vocational training, youth development, Youth Empowerment and tagged Africa, Backpacks for Peace, Become a Classroom Hero, College Degree, cosmetology, Cosmetology Course, education, Instructor, Liberia, NGO, Skills Training, Student Coordinator, Thank You, trade school, Uniting Distant Stars, Vocational Training, Youth Development, Youth Empowerment. Bookmark the permalink.